A lot of Star Wars content creators have gotten quite brazen in defending their art on social media platforms over the past year, especially in wake of The Last Jedi, one of the most divisive releases in the current canon. At least half of the fans hated the movie, perhaps even more so. And director Rian Johnson has been trashed for his attempts at subverting expectations. Now, the director has decided to fire back, and he very carefully put one popular Youtuber in his crosshairs, going after the equally divisive Mike Zeroh in a series of disenchanting tweets that have since been deleted. Mike Zeroh is quite well known by Star Wars fans, as he uploads new content to his Youtube channel on a daily basis. He often covers the latest rumors, going over every aspect of the franchise with intel he gets from various sources. The guy isn't always right, but he never claims to have any confirmation on his rumors until it's authorized by Disney and Lucasfilm. He goes out of his way to point out speculation and theories. Because of that, his batting average isn't always great. 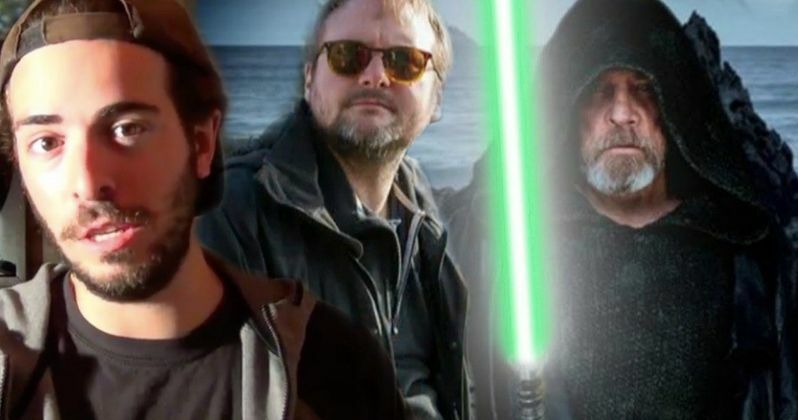 But Zeroh really ruffled some feathers with team Lucasfilm when he published a new video claiming Rian Johnson's upcoming new Star Wars trilogy, which will fall outside of the Skywalker saga and feature all new characters and locations, had been canceled. Zeroh did claim that Johnson may now only make one new Star Wars movie, but that a full trilogy will depend on how that first film is received. This actually makes all the sense in the world, considering the box office failure of Solo, which was supposed to be a trilogy, with star Alden Ehrenreich contracted for three films that are 99.9% definitely not happening at this point. Rumors of Rian Johnson's departure from Lucasfilm and the cancelation of this new trilogy had been swarming for a while. They tie into the rumors that Kathleen Kennedy is leaving Lucasfilm in September, and that Johnson is going with her. None of this has ever been confirmed by any real sources connected to Disney or Lucasfilm. Johnson has been asked multiple times about his upcoming new Star Wars trilogy on social media, but he's stayed relatively silent. Until earlier this week. A fan asked if Johnson was still working on his trilogy. He simply replied, 'Yup.' This was followed by the fist bump emoji. It was only later that Rian Johnson learned that Mike Zeroh was responsible for the rumors that Johnson was leaving Lucasfilm and that his upcoming Star Wars trilogy had been tossed in the trash. And this caused a reaction from Johnson that was quite unexpected. "Wait. Hahahahahaha this is all because of Zeroh? HAHAHAHAHAHAHA. When we were in production we had a guy keeping an eye on online rumors. At some point we started using "Zeroh" as a verb. Like, "throws trash at basket, but it slips out of your hand and falls behind you." "Zeroh'd it." Shortly after Rian Johnson made these tweets against Mike Zeroh he deleted them, but not before they were captured for posterity by a couple of other prominent Star Wars Youtubers, who couldn't believe that the Star Wars director was going after the Youtube community in this way. And many have come out against Rian Johnson for this bullying tactic. The one person that hasn't spoken out is Mike Zeroh, who perhaps doesn't even know any of this happened. He did not respond on Twitter or Youtube, and has just continued to post his future Star Wars content with several new videos that never address Johnson's comments but instead look at new rumors and speculation regarding the upcoming Star Wars 9. One thing is quite noticeable about his most recent videos since this happened, he has taken himself out and instead is showing various photos and concept art in his place. Along with Rian Johnson, Pablo Hidalgo is another Star Wars content creator and contributor that has attacked fans on social media. Many have mixed feelings about these creators jumping in the mix. Johnson obviously had second feelings about it, too, or he wouldn't have deleted his tweets so quickly. Furthermore, some Lucasfilm insiders continue to insist that Kathleen Kennedy will be gone come this September, and that Rian Johnson will go with her, not even giving fans the first chapter in his proposed new Star Wars Trilogy. Here's a look at the deleted tweets along with videos of a couple other Youtubers coming to Mike Zeroh's defense.